When life gives you lemons? Be grateful and get into the kitchen! It’s my favourite home-produce time of year – the Meyer Lemon tree in my back yard is groaning under the weight of ripening fruit. Be prepared for plenty of lemon-y recipes over the next few months. Most Australians call this recipe Lemon Butter, but it’s also known as Lemon Curd, and it is fabulous in tartlets, as a spread on bread, in the bottom of a lemon meringue pie, or dropped in fat dollops over ice-cream. I have also been known to eat it straight out of the jar with a spoon – purely for medicinal purposes of course. One corner of the mighty old Meyer Lemon tree in my backyard. 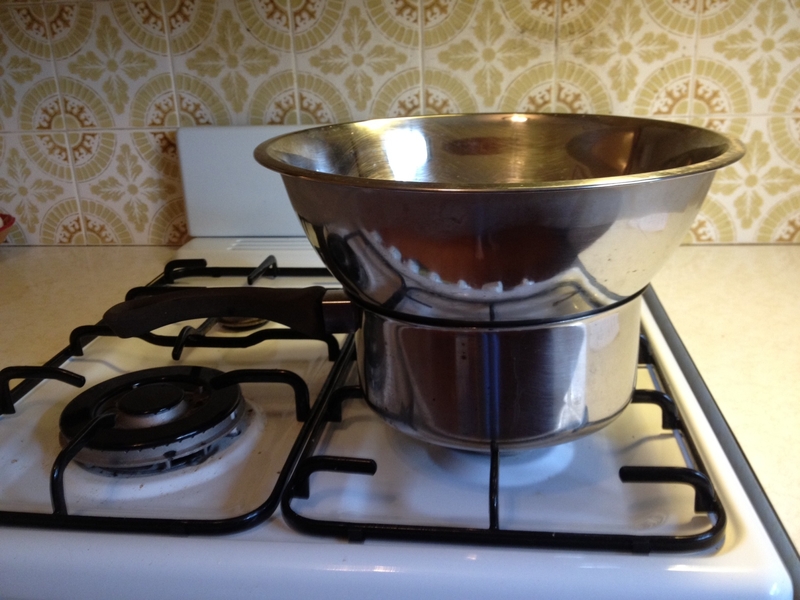 Make a double boiler by half filling a saucepan with warm water and bringing it to a very slow simmer, and then snugly fitting a basin over the top. Pop the sugar and eggs into the basin, and begin whisking. You could use a wooden spoon if you prefer but what’s not to love about a good whisk? Beat until the sugar is dissolved. 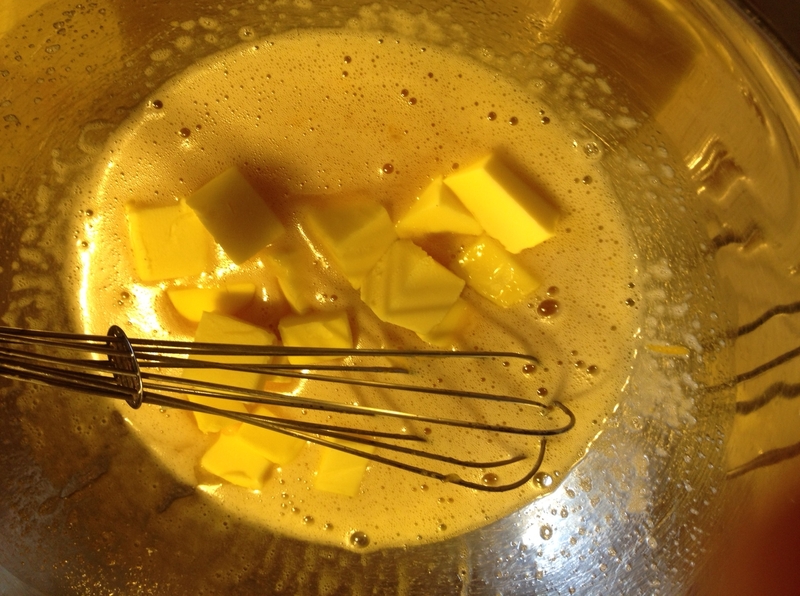 Then dump in the cubes of butter and whisk again until amalgamated. When the butter is melted add in the lemon zest and juice and keep whisking over low heart until mixture thickens, which will take about ten minutes. Don’t let it boil or it will curdle! Mind you, if the heat is too low it shall take longer to thicken, but you will get a good arm workout. Finally the mixture will have a rich, silky texture and shall coat the back of a spoon thickly. It will also thicken a little more as it cools. This entry was posted in Condiments and Preserves, Gluten-free and tagged Australian recipe, baking, cooking, dessert, easy recipe, food, gluten free, gluten free treats, lemon butter recipe, lemon curd recipe, lemon recipe, meyer lemons, recipe, vegetarian by Cauldrons and Cupcakes. Bookmark the permalink. Thank you for posting this! 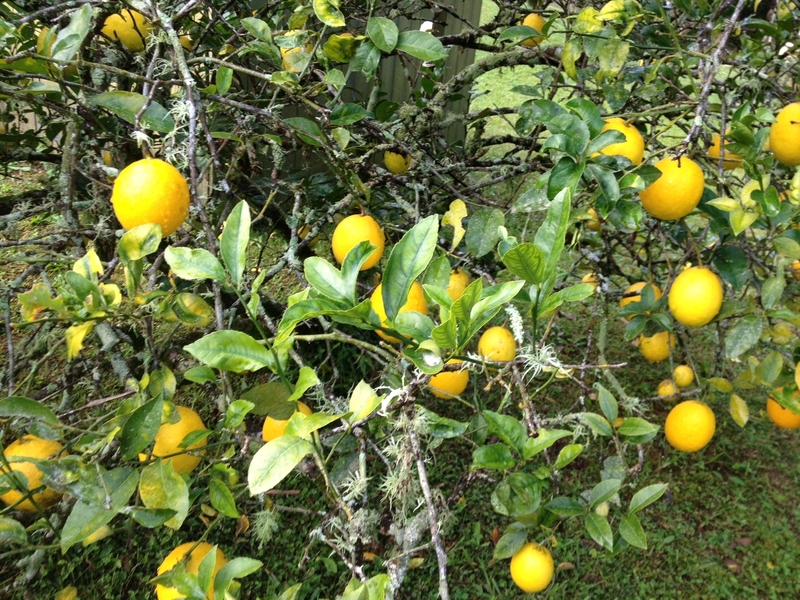 You are so blessed to have that beautiful Meyer lemon tree in your yard. 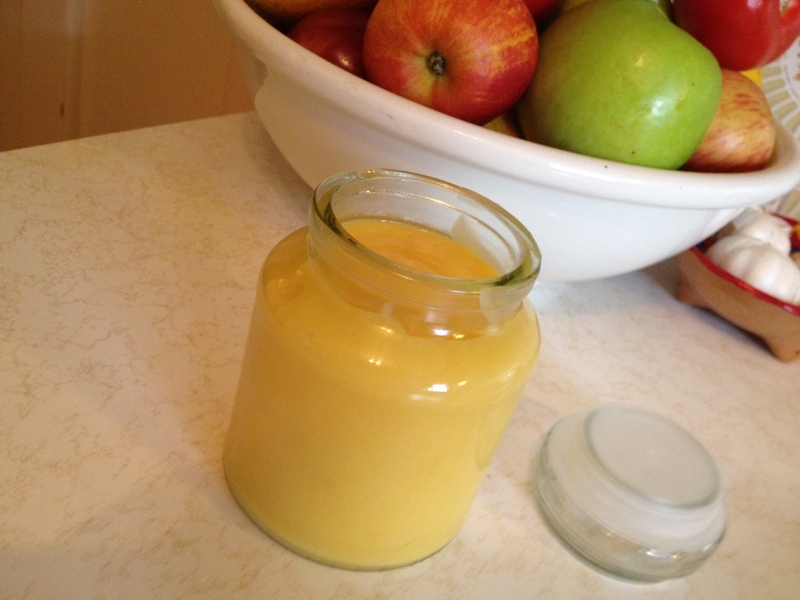 I LOVE lemon curd…I can’t wait to make this easy recipe! 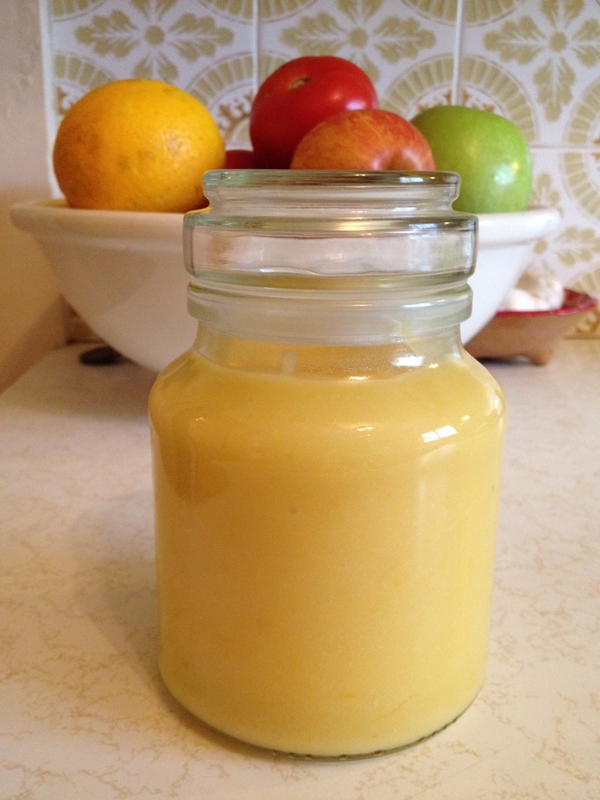 Wonderful post – Lemon curd is a favorite. I look forward to trying this recipe. Wish I had a lemon tree. … Thanks for sharing! 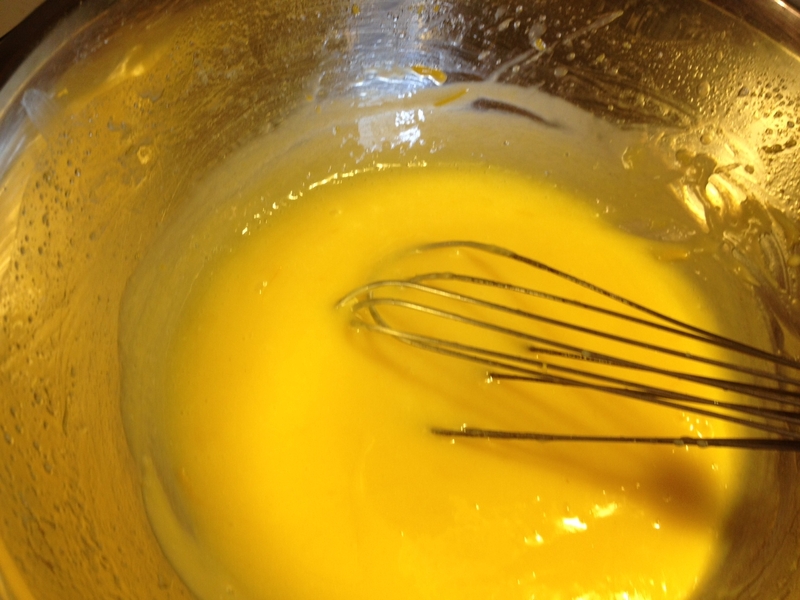 Meyer lemon curd made from your own Meyer lemons sounds so divine. Just the color of the fruit makes me smile and think of sunshine. Beautiful color on the curd too. It’s so versatile! My mouth is watering! Your lemon curd looks delicious and how wonderful having all those lemons. I’ve always thought making your own lemon curd was impossibly difficult but this looks achieveable. My mum made a lemon cake recently and sandwiched it together with wonderful lemon curd and it was all squidgy and lemony and tangy. Hurrah for lemon curd/butter! Wow..,.you have given me a wonderful idea with a cake…thanks for that…am just about to make the lemon curd with a bucket full of lemons from a neighbours tree….can’t wait and to make the cake sandwiched together with lemon curd…Yum …I will be in lemon heaven…..
What a beautiful tree, I’m very jealous! A big thanks for liking my Joy and Gratitude post. You are definitely one of the first people I thought of when writing it!-including your wisdom and inspiration, and of course the FOOD!!! I haven’t had lemon curd in years and years, had forgotten about it till I saw this. Yum, saving this to make! I bet its breathtaking to step outside and see that amazing tree! I can only imagine! You are blessed! Mmm, I love lemon curd and miss it as you cannot find it in France. Will be sure to try it…Thanks ! Just wondering how long the lemon curd will last, my lemon tree is also overloaded with lemons and was thinking of making a few batches. Lemon Butter but can’t find a recipe. I said I will Google it, yeh right he said. So your recipe is on it’s way to him. Thank you I look forward to tasting his attempt. Just made the lemon butter and it’s yummmm. Looking forward to sharing, but not too generously heheheheh. I’ve just come across this recipe, thank you so much! Everyone’s a fan, my mum says its just like her grandmother used to make. Love the step by step photos too. 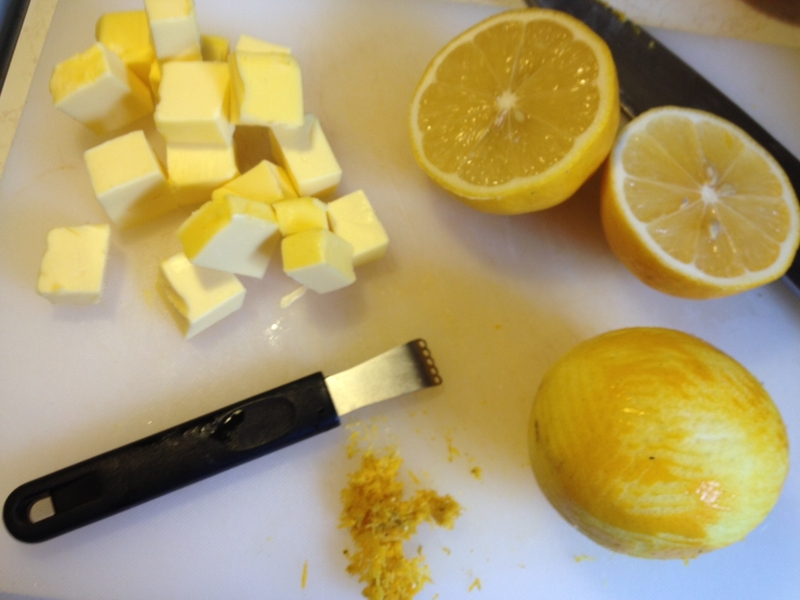 I have never made lemon butter before and this recipe was really straight forward and easy. I have read other recipes with more lemon juice – but this recipe has a wonderful balance of tart and sweet. Thank you. Highly recommend the recipe!! I have just made this as a birthday gift for a ninety year old who use to make it for me, I am please to say it is delicious and will be sure to make it again. So jealous of your lemon trees! Beautiful! Thanks for sharing you recipe! All the instructions gave me enough confidence to give it a shot – I now have 7 jars full in the cupboard with one more batch to make tonight. It’s absolutely delicious and decadence on a scone… Thanks again! I made two batches for my family and friends. 6 jars. I could have probably eaten through a jar by myself, it is so delicious. I saved one jar for Sunday pancakes. I jumped in my car and delivered them as soon as they were cold! I have made your Fudge recipe and now the Lemon Curd recipe. Both are sensationally delicious and easy to pop together. The best thing about it all is I can share my spoils and spread my love. Thank you for sharing your words and recipes. Peace and Love. My granddaughter wants either lemon meringue or key lime pie for her birthday cake this year. As I haven’t made one for 20 years or so I googled a recipe. Yours is very similar to my mum’s but she doesn’t use the white of the eggs, just the yolks, so double the eggs and you get a very satiny, velvety yumminess which I’m not allowed to eat any more due to diabetes. She also always used salted butter because it makes it that much richer. Like it needs to be! My in-laws have a whole orchard of citrus trees, including a couple of lemon trees. My husband has been asking for some lemon butter (his mother normally makes it but she is away at the moment). I tried your recipe yesterday and he’s already asking for more! Thank you! So easy and yummy! First time I have made Lemon Curd and it was a great success. Everyone loves it. Thank you very much.